EVER WONDER why some coasts have two high tides while others have one, or almost none? Author Jim McCully did. He asked professors, astronomers, even charter captains, but their responses were inaccurate, incomplete, or flat-out wrong, some erroneously based in waterlore, some on bad science. After long research, McCully could not even find a lay book that fully explained the phenomenon of the tides. 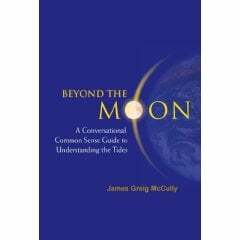 So he wrote Beyond the Moon: A Conversational, Common Sense Guide to Understanding the Tides, released in January by World Scientific press. “The world is full of people who use the tide tables every day but do not understand the forces of nature that generate the tides,” McCully writes in the opening chapter. During his research the author discovers nearly 400 forces that influence tides, 114 of which NOAA (National Oceanic and Atmospheric Administration) employs to generate their tidal predictions — 37 of which have a measurable influence on the earth’s tides. Fear not — McCully contends that the average interested angler can be 90 percent accurate by creating his own tide predictions using only 7 principle influences. Beyond the Moon provides a thorough look at these, both celestial and terrestrial, then credibly digests them for those of us who barely scraped through Earth Science. A full and complete understanding of the tides is a tour of many disciplines. McCully’s dissection of the sciences eases the journey and his prose is very readable, even literary at times. You get earth science, sure, but you get history and digestible celestial mechanics, too — it’s even funny in places. Helpful graphics, both line drawings and color illustrations, make the journey smooth. But it’s McCully’s knowledge of the subject and writing skills that make it a fun ride.